From humble beginnings to one of the biggest names in the medical device industry, Medtronic continues to be a strong force across a vast number of medical markets. The company is organized into four operating sections: Cardiac and Vascular, Minimally Invasive Technologies, Restorative Therapies and Diabetes. The Cardiac and Vascular group includes three divisions: Cardiac Rhythm and Heart Failure Disease Management, Coronary and Structural Heart and Aortic and Peripheral Vascular. The Minimally Invasive Technologies Group consists of two divisions: Surgical Innovations and Respiratory, Gastrointestinal & Renal. The Restorative Therapies Group includes four divisions: Spine, Brain, Specialty Therapies and Pain. The Diabetes Group develops products for the management of Type I and Type II diabetes. The cardiac rhythm management market was Medtronic’s first foray into the medical device market. The company gained significant traction after it introduced a wearable and battery-powered pacemaker, the first of its kind. Over the years, Medtronic has been able to retain their leading position in this market as a result of brand recognition, strong customer support and a large sales force. 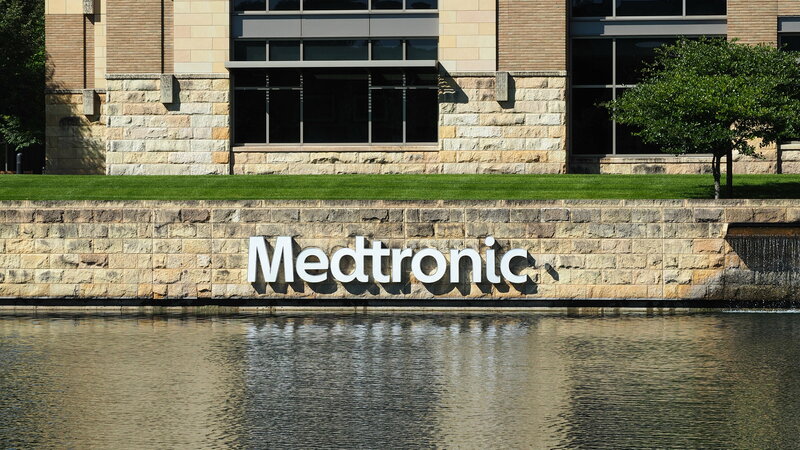 Although Medtronic lost some market share to St. Jude Medical (now owned by Abbott), the second-leading competitor, following the recall of their Sprint Fidelis® defibrillation lead in 2007, the company continues to lead the market by a wide margin. Abbott (St. Jude Medical) also made considerable gains in the market at Boston Scientific’s expense after the 2010 recall of their CONFIENT Implantable Cardioverter Defibrillator. Boston Scientific has since made great strides towards recovering the market share they lost in 2010, with increased focus on growing its share in the pacemaker market where it has now surpassed Abbott (St. Jude Medical). Biotronik competes and holds notable shares in every segment of the cardiac rhythm management market. Similar to other leading competitors, Medtronic is active in a large number of segments, and often holds one of the highest positions in each market. Medtronic performs the strongest in the interventional coronary catheter market, where it holds over one third of the overall market share. Abbott closely competes with Medtronic and market leader Boston Scientific. The company has significant growth potential due to its monopolistic position in the coronary optical coherence tomography market, which was recently granted favorable reimbursement. Another key competitor, Philips, is currently the only manufacturer to offer a laser atherectomy device and is expected to benefit from growth of this market in the future. Medtronic’s strong position stems from a substantial presence in the transcatheter heart valve replacement (THVR) segment, the largest within the cardiac surgery market. The THVR market, as well as the overall market is currently led by Edwards Lifesciences. Medtronic was also able to elevate their position in the ventricular assist device market as a result of its acquisition of HeartWare International in 2016, the third-leading competitor in that market at the time. Abbott is the leader of the ventricular assist device segment; this, coupled with their newly acquired structural heart portfolio from St. Jude Medical in 2017, gives Abbott a large share of the total market. Maquet specializes in coronary artery bypass grafting procedures. They are the market leader in the off-pump coronary artery bypass and endoscopic vessel harvesting device segments. Medtronic holds many accounts with large hospitals which lends to its strong presence in the syringe and needle market. Becton Dickinson also leverages its established relations with major hospitals and distribution networks to sell at high volumes. FUJIFILM and Teleflex derive their shares from dominance in the ultrasound vascular access device market and central venous catheter market respectively. Medtronic is the leading competitor in the peripheral vascular devices market. The company derived its position from a strong showing in the high-value atherectomy, stent graft, stent and drug coated balloon market segments. Medtronic ranks second in the stent graft market, having lost market share to W.L Gore in recent years due to lack of product innovation. Cook Medical’s strong showing is attributed to its long-running monopoly in the SFA drug-eluting stent (DES) market. The company’s position in the SFA DES market has been challenged by the entry of Boston Scientific’s Eluvia™ Drug-Eluting Vascular Stent System to the market and the recent IMPERIAL trial findings revealed at TCT 2018 which showed that the Eluvia Stent demonstrated superior 12-month data. Medtronic became the market leader in 2015 after its acquisition of Covidien, which had established a leading position in several key markets prior to the transaction. This leading position translates mostly from their success in the telehealth, EEG monitoring and pulse oximetry markets. Philips is also a major competitor in the telehealth market, offering remote monitoring to patients with their eCareCompanion™ platform. Masimo generates the bulk of their revenue through sales of their disposable pulse oximetry sensors, which are expected to compete strongly against Medtronic’s Nellcor™ brand. While GE has established a presence in the pulse oximetry market, the company finds greater success in the multi-parameter vital sign, telemetry, as well as fetal and neonatal monitoring markets. Medtronic is a leading competitor in both the traditional and minimally invasive (MIS) spine markets. DePuy Synthes will remain strong competition for Medtronic in these markets with its diverse line of traditional and MIS fusion devices. Stryker competes with Medtronic mostly within the traditional spinal device market, offering a competitive line of thoracolumbar fixation and interbody devices. In contrast, NuVasive has a much stronger presence in the MIS market where it presides above Medtronic. While Medtronic competes in both the ENT and bronchoscopic device markets, it is most recognized for its involvement in powered instrument products within the ENT device market. Olympus is the leader in the bronchoscopic device market; however, it’s main limiter, similar to Medtronic, is a lack of involvement in the balloon sinus dilation (BSD) device markets. Acclarent (now owned by Johnson & Johnson) and Smith & Nephew are both involved in the BSD device market, with Acclarent having a much larger presence. Medtronic placed third overall in the gastrointestinal market due to its acquisition of Covidien, a company that had leading shares in the enteral feeding device, capsule endoscopy and Barret’s esophagus ablation segments. Covidien was the first to enter the capsule endoscopy market, allowing it to gain a significant first-move advantage. Their extensive installed base allows them to retain customers and deter them from switching to the only other major competitor in the market, Olympus. Boston Scientific and Cook Medical perform strongly in a variety of different gastrointestinal segments, including the endoscopic retrograde cholangiopancreatography, as well as stenting and dilation markets, and are looking to leverage their current success to expand into new markets. Medtronic dominates the neurological device market with leading shares in the cerebrospinal fluid management, liquid embolic, neurovascular stent, neuromodulation, intrathecal pump and mechanical thrombectomy markets. Boston Scientific trailed just slightly behind Medtronic in 2017, but has on numerous occasions successfully displaced Medtronic as market leader. Abbott (St. Jude Medical) and LivaNova both compete with Medtronic in the neuromodulation device market; the former specializes in deep brain stimulation, while the latter leads the vagus nerve stimulation market. Medtronic participates only in the urinary incontinence segment of the urological device market. Boston Scientific, C.R. Bard and Coloplast all compete in the urinary incontinence segment, in addition to substantial roles in the markets for erectile dysfunction and nephrostomy devices. Medtronic’s dominating position in the insulin pump market and strong presence in the continuous glucose monitoring (CGM) and insulin syringe markets allows it to capture a significant portion of the total market share. Leading competitors Sanofi, Novo Nordisk and Eli Lilly all hold leading positions in various segments of the insulin market which accounts for over 50% of the overall market value.